Discover a "taste for gold" when you bite into these delicious, California grown, Ororblanco Grapefruit from Pearson Ranch. Referring to the subtle "white" flesh of the fruit, oro blanco in Spanish literally means "white gold." Though the technical name of the variety is spelled as one word (Oroblanco), it is commonly accepted spelled as two separate words. Either way, oroblanco or oro blanco grapefruit is a cross between a pomelo and a white grapefruit. 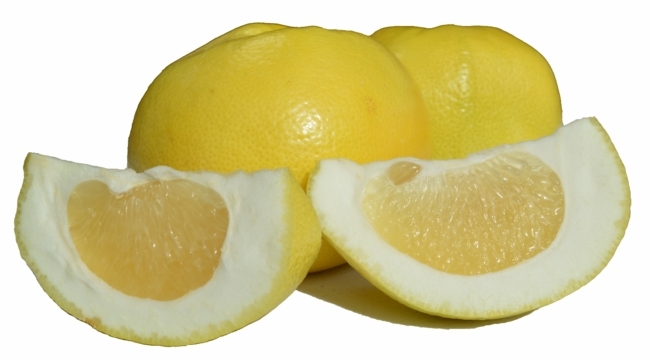 Sometimes also referred to as a "Sweetie", they are indeed sweet while lacking the bitterness of a common grapefruit. With a thicker skin, they are as easy to peel as an orange, and filled with up to 110% of the recommended daily allowance for Vitamin C' in each one, you will be eager to start your day at the breakfast table ready to... "go for the gold!" How many pounds of Oroblancos do I get in a box? Pearson Ranch sells it's Oroblancos in 20 pound Quantities (approx 16-20 per box).